Education is a constantly changing topic in any country, and how to provide the best education for the most possible people is a conundrum debated about frequently, intra and internationally. My main research focus for this project was the troubles and limitations facing Ethiopian students when attending school; or trying to in some cases. For this research I interviewed three Ethiopians–two students and one teacher–living in the United States coming from a range of different environments. These interviews took place in several different locations depending on where the interviewee felt most comfortable. During these semi-structured interviews, I asked questions concerning their childhood and their experiences in the elementary, middle, and high schools in their communities. I have been interested in Africa for the last three or four years. I first looked into the Peace Corps roughly four years ago. I had no idea how austere the application process was or that I had to have a specific destination in mind; I thought they would place me as they saw fit. However, upon learning that I had to be a lot more decisive and educated, I started to think about where I wanted to go while finishing school. After unintentionally reconnecting with an old friend, I had heard that an old school mate had gone to Africa through the Peace Corps and she loved it. So I took a class on African history and learned about the rich, diverse culture of Ethiopia–amongst many other countries. I immediately took an interest in Ethiopia, especially after learning that they were one of only two countries not colonized by the Europeans in the Scramble for Africa. My main goal from this research is to better understand how the lack of resources and financial and social capital can directly affect a child’s probability and desire to attend school. I wanted to learn if these restrictions, paired with the proximity of schools, parental influence, and many other reasons, deterred kids from becoming students and seeking a higher education. I discovered common themes from my interviews, most between the two students, and I learned a lot about the hardships facing these tenacious Africans. Nevertheless, after analyzing my collected data, I believe that the lack of schools and resources, especially to rural Ethiopians, perpetuates a lack of emphasis on education and thus contributes to low attendance rates for the Ethiopian youth. I will illustrate and discuss this in three cases below. 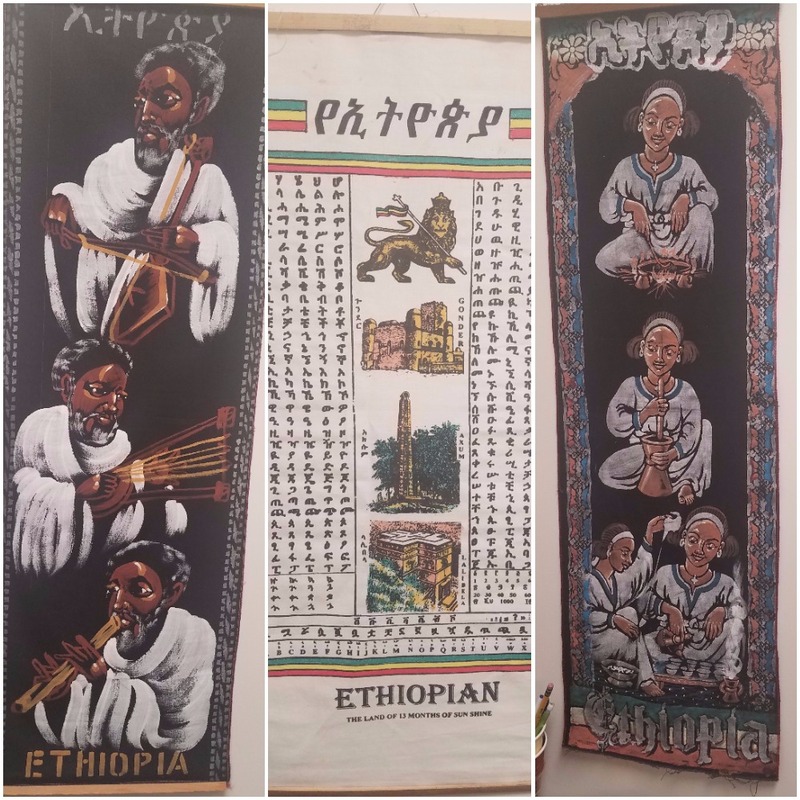 Left and Right: Art hanging in Dr. Eshete’s office from Ethiopia. Center: Amharic alphabet hanging in Dr. Eshete’s office. Dr. Tibebe Eshete is an adjunct history professor at Michigan State University. He is of a different cohort and thus only plays a minor role in my research. He has a much different educational experience than do my other two participants. He grew up in a small village outside of a muslim city called Harar. It was in this village that Tibebe attended class comparable to kindergarten. 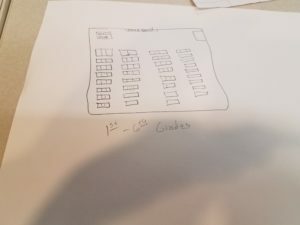 Tibebe and his classmates would sit on the dirt floor circled around the priest, who sat in a chair, elevated above the children. 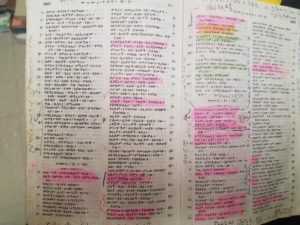 The priest, who wasn’t trained to educate in the formal sense, would teach them about the Bible, pictured below, and the alphabet for Amharic, the national language and pictured on the left. The following year Tibebe attended an Elementary school roughly four or five miles from his house. He would walk to and from this school each day and still considered himself “lucky”. According to Dr. Eshete, it was a primarily Catholic school that taught a government instituted curriculum for grades first through sixth. He learned typical subjects like math, science, and history, and he had classes like “sport”, which is analogous to gym, and “craft”, which taught things like painting and cutting wood. In addition, the students learned to speak English through chants and songs. When discussing this, Tibebe recounted some of the songs and began to sing in the interview. He sang a song that sounded familiar to “99 Bottles of Beer on the Wall”; it was quite entertaining and apparently nostalgic for him. Upon completion of the sixth grade, Tibebe went to a secondary school in Harar, which was seventeen miles away from where he lived. Because this isn’t a daily walking distance, Tibebe had to move to Harar during the school year and live with relatives. Eventually his mother moved out to Harar to be with him. When I asked him why they deemed it advantageous to send their kid to a school so far away even though it wasn’t feasible, he told me his parents knew “the value of education”. It was around this time that Dr. Eshete claims he started to understand it as well. “I think the Pandora Box was opened after tenth grade,” he tells me. However resonating this topic may be, it still has negative connotations. I asked Tibebe about the number of females in his classes and he explained to me that there were very few women in class because the parents don’t feel comfortable sending their daughters to school because “women aren’t supposed to be independent”. He states that his parents knew the value of education, and they deemed it too worthy for a woman. This can be damaging to creating an equal and fair playing field and degrades women to being the stereotypical household keepers. Samuel is the youngest of 11 kids, six of which are boys and the rest are girls. He was born roughly four or five hours outside of the capital in a city called Jimma. When asked what Jimma was like, Sam told me, “I grew up in a like, not in a farm area, in a countryside. Not super country, but in between,”, and you can see his interpretation of this in the figure below. 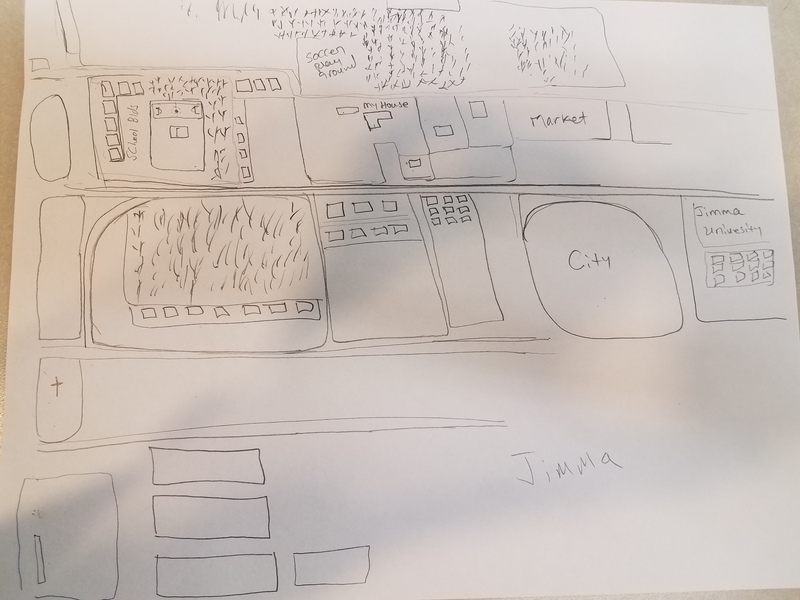 Top: City of Jimma, handdrawn by Samuel. Right: One of the many clips of Sam talking about soccer. He and his family would wake up around five am every morning and do some gardening and tend to the cattle; which they had a very small amount of. After the morning routine, it was time for breakfast and school. 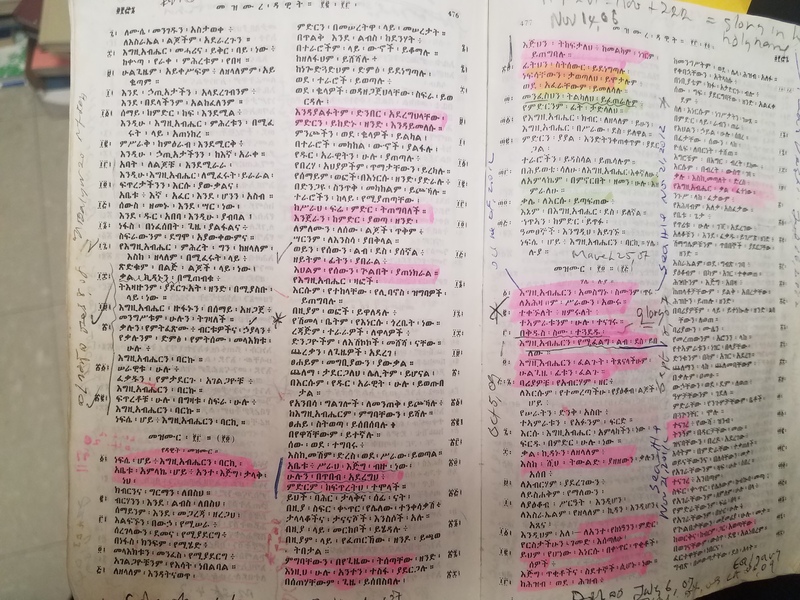 Sam attended first through sixth grade in Jimma where the students had to share textbooks with each other due to shortages. On top of that student were responsible for their own lunches, because the schools did not supply them. However, quickly after explaining how difficult it was at times, he launched into a talk about soccer–he loved to talk about soccer. “We just love soccer, any condition, any chance you get,” Sam once told me when I asked him about other sports the kids played–although he did mention that a lot of other students also enjoyed volleyball. Typical classroom for 1st-6th grades in Jimma. Hand-drawn by Samuel. After finishing the sixth grade in Jimma, Sam and his family moved to Addis Ababa, where Sam attended seventh grade. However, after the move Sam became the victim of the term I’m going to coin ‘The Walk for Education’. He explained to me that once he moved he had to travel a mile or two to school each way, but was never deterred because he knew the sacrifice his parents had made to get him there. After the seventh grade is where Sam gets an even more rich educational background. Upon completion of the seventh grade, Sam and his family moved once again to Nairobi, Kenya. And even though my main focus was in Ethiopia, it was nice to get experience in another African country as an international comparison. In the simultaneous transition from seventh to eighth grade and from Ethiopia to Kenya, Sam encountered an easier science based curriculum. He claimed that the level students start math at in high school in Kenya was what students started in seventh grade in Ethiopia. However, he followed this up by explaining that English was more prominent in Kenya and that he lacked the initial skills to keep up with the other students. Additionally, Swahili was spoken quite often as well, and Samuel just didn’t code switch as quickly or efficiently as the other students when he first attended the school in Kenya. It was also at this school that Sam experienced another resource dilemma facing students in a contemporary African classroom. “Something, uhh, I recall; we didn’t have any lab class. And the science students (inaudible) you don’t see them practically […] Yes, you see maybe pictures [or] videos, but nothing actual touching, you know? It makes it, uhh, very challenging.” Here Sam recounts how difficult it was to learn being a hands-on student in Kenya. He explained to me in the interview that he and his fellow students could only learn so much from the videos and textbooks, but they never learned how to truly apply it in the real-world. Sam explains the difficulties stemming from the lack of resources. Lastly I present Krubel Habteyes. Born and raised in the capital of Ethiopia, Addis Ababa, Krubel had the most social capital out of the participants. “People took it for granted. I know I did,” he told me in our first interview in regard to his class position. He is the oldest of three siblings, and his two sisters are still currently in school in Ethiopia. His mother tended the home while his father worked for the United Nations as “[…] a security officer. I’m not really sure.” No matter his position title, Krubel made it very clear that his father worked very hard to provide for his family and ensure the best in their future. Top: Map of Krubel’s neighborhood in Addis. Hand-drawn by Krubel Habteyes. Left: Krubel explains how his free time was spent while in school. Krubel attended a public primary school, first through fifth grades, in Addis where most of the teachers were Ethiopian. Here the students learned the alphabet, basic math, science, history, and English. He explained to me that the level wasn’t very difficult when he first started so he had free time on the weekends. He would watch a lot of TV, like the Power Rangers, or he would visit relatives that lived near by. Because this school was public, almost all of the kids in the area were able to go for little cost. However, attending school after this became more of a challenge to the students. The schools are more expensive and more disperse. But with his father’s background at the UN, attending higher grades was very feasible for Krubel. Krubel attended what he called “The American School” after the fifth grade. This was a school taught mostly by foreigners with a few African teachers sprinkled in; all of whom were English speaking. According to Krubel, the school attracted many foreign students. 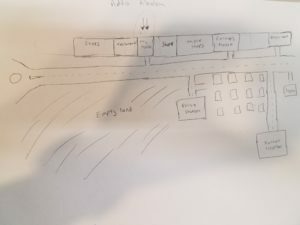 “I think it started off American and then became an international school,” he recalled. When I asked him if there were any women in his class he explained that there were several women in the school, but “they were daughters of diplomats”. Again, women were only able to go to school when it was deemed appropriate and cost efficient. This supports the fact that women are most often deemed not worthy and are denied the opportunity to attend school thus widening the gender education gap even more. 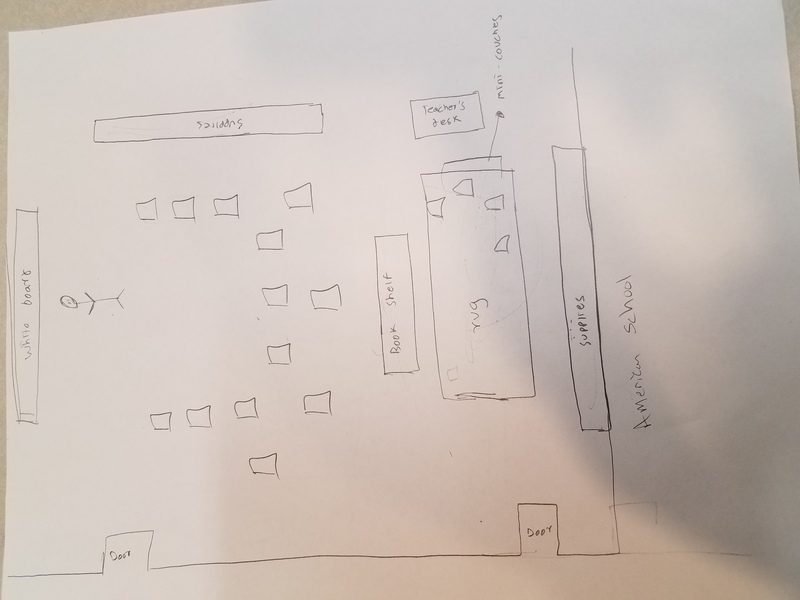 Top: Layout of a typical classroom in the American School. RIght: Krubel explains the gravity of the UN’s help in his ability to attend the American School. It was also in this school that Krubel experienced his first notable discrepancy in social capital, but in the exact opposite of the previous ways discussed. 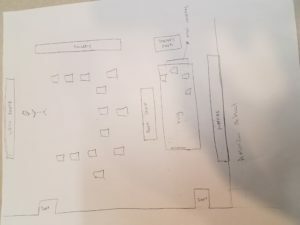 He mentioned to me that he noticed a significant difference in the available resources between the two schools; The American School having much more. According to Krubel, there was “better internet” and “the teachers were more engaging”, which made learning more fun for him. He was experiencing the better side of the educational disparities. Additionally, due to his father’s background with the UN, Krubel was able to attend this school entirely on the UN’s dime. Krubel’s educational path has been one on the better side of the Ethiopian education disparities. He took advantage of his father’s social capital and he believes that he is doing the most with the opportunity. He explained to me that he didn’t have much parental pressure in attending school because he was always so vehement about attending himself. When I asked him why he had always seen school as imperative, he couldn’t remember one exact reason but he did recall, “I remember witnessing poverty and realizing that you have to work really hard to get away from that. I think that’s a hidden pressure.” Even though Krubel was more fortunate than others, he was still not deprived of educational difficulties. He attended an elementary school with a smaller budget and, thus, lesser resources. He then attended a school in which a lot of students were international, the teachers were foreigners as well, and they taught in English, a language different than that of the nation. Though through it all, Krubel counted himself to be lucky. He told me at the end of our last interview, “We all agreed that the benefits of going [to school in the United States] are much greater than [Ethiopia],” and he made sure to remind me that his parents knew the value of education and had instilled it in him. I learned a lot through this process, the most important being the education opportunities available to the select few Ethiopians that I interviewed. I learned that there are significantly better opportunities offered to those who have the social and financial capital. For students like Tibebe, and inevitably Samuel, walking five miles or more is very common thing to have to do in order to attend school. The distances may be even greater for those who live in the rural areas; although it was difficult to find any students from a rural background that also had the means to study abroad. Additionally, once these students can find the means of attending school, the supplies offered were inadequate and very limited. According to Samuel, sharing textbooks with classmates was expected in his first years in school; not to mention the daily responsibility of providing food on top of tuition. Additionally, there is an overarching theme that I encountered in my research. The value of education can have both a destructive and a beneficial outcome. In the case of Dr. Eshete, he explains that his parents knew the value of education, and he then later stated that “women weren’t supposed to be independent” and that most parents didn’t see the benefit in sending their daughters to school. Therefore this idea of value can hold pejorative connotations, even if unintended. On the contrary, this value of education was what motivated and drove both Sam and Krubel to finish school and take advantage of their chance to attend Michigan State University. Lastly, I conclude with a reflection on the process; the interviews, the collaboration, the gathering, and the organizing. I enjoyed this project. Like I mentioned before, I have had an interest in going to Africa for several years now, and to get a chance to talk to people who were born there, identify as African, and can share their story with me was an exceptional experience. In addition to the several new friends I made, I learned a lot about the process of data gathering. I learned how to structure an interview, but also how to change it when a participant goes off track. Overall, I learned that I am still extremely interested in going to Africa.